Nintendo released some new info, media, and video previews about the Wii console on their site. 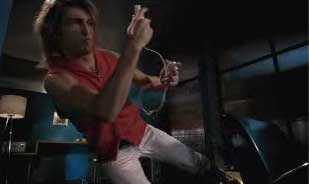 I had to chuckle, though, because in one of the video clips, we see a bushy-haired young man probably in his 20's, wearing a hooded tank top, sitting in his dark apartment room waving his "wiimote" around wildly, then, he freaks out and starts rolling around on the floor and jumping all over the place while playing Metroid. Yep, I'll likely buy a Wii also. I'll probably wait a while 'til the price comes down and until the public has had a few months to digest it.